At the age of 950 years, Noah, who shepherded God's creatures through the Flood, died. He left behind three sons, from whom the human race descended, according to the Bible. The illumination visualizes his death in contemporary terms: The elderly patriarch lies in a simple wooden bed covered with a quilt and attended by members of his family. 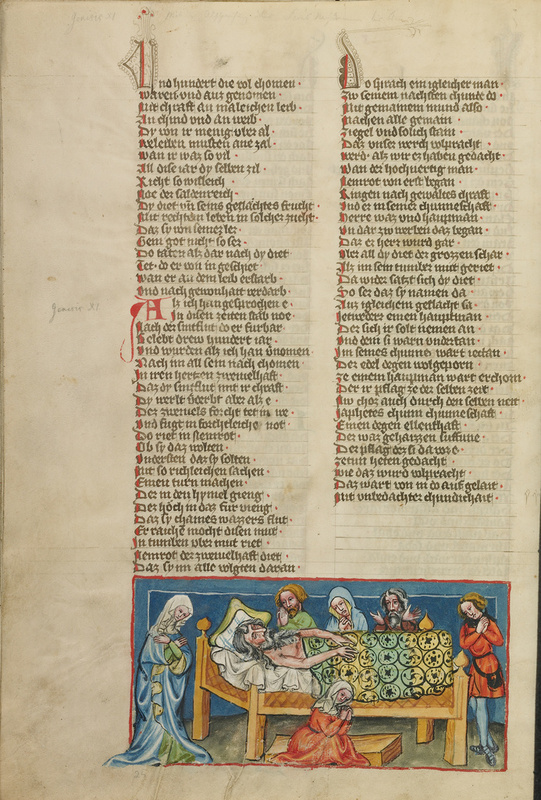 This miniature completes the portion of the Weltchronik devoted to the life of Noah. Stories from the book of Genesis continue on the facing page with the tale of the Tower of Babel, accompanied by a miniature of the tower's construction.